Today I want to show you some pretty bling-y things. Not too long ago, my friend Pauline (she has this awesome YouTube channel, btw) sent me the whole set of Bbia pigments from Korea. I have not really followed Korean makeup trends lately, so I did not know about the brand at all. Apparently this hip and affordable brand called Bbia (삐아) and its pigments are very popular in Korea. I can't say I am big on pigments in general because I often find them messy and dry. Pigments end up everywhere unless you're equipped with a sticky base. But, these Bbia pigments are quite different from what I have experienced (I admit I haven't really explored that far, though.)! Okay, enough talk. Let's look at the pretties again. 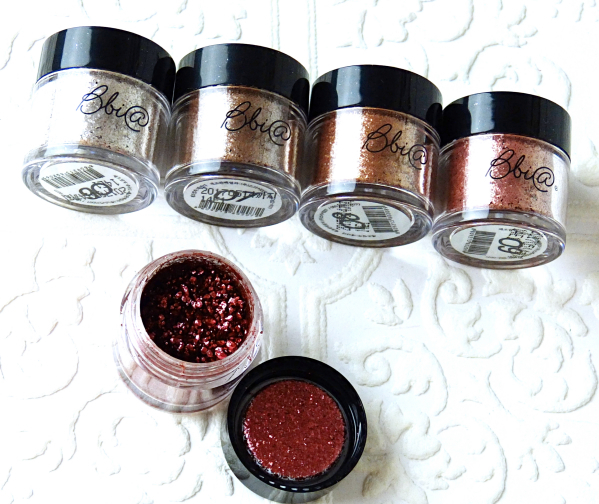 As you see here, it comes with different size of glitters and shimmer, and more importantly, in a semi-wet formula. You see the pigments are bunched up a little in the jar? That is because they are not completely dry. So you can apply with more ease and get multi-dimensional looks. Each color is numbered but also has a cutest name. Here, I roughly translated the names of the colors for you. My favorites are 01 and 05. They seem to have creamier texture compared to other shades. 02 and 03 are too warm and don't look all that different once worn. My only gripe is that the whole set leans maybe a little too warm. 5 Light series are packed with bigger and more dramatic glitters with deeper tones. I like the colors from the 5 light series better but I find the bigger glitters are not as great for everyday use. These will make your eyes pop, however. I put on just a little bit of 07 in the center of my lids using my finger tip, and the sparkles still were visible in a dark club. A great party makeup item. The naming for the 5 light series is even more hilarious, but it is a little tough to translate into English (The first two start with Sunlight and Moonlight then it gets funny after that), so I will just leave you with the numbers. The "Flavor" series is more suitable for daily wears. I just put on some black base and add pigments on top and blend in. It is great paired with more dramatic lip colors without looking too strong. The "5 Light" series is best to be used as accent colors, added in the center to give more dimension. I have tried using it all over but I thought it was too much. Good thing is that they stay on very well even though you still see some glitters end up on your cheeks and even on your décolleté. For the affordable price, these are really excellent quality and add tons of fun to my somewhat conventional makeup routines. I do not think they are available in the U.S., but I have seen them on eBay, each jar priced less than $6. You can see clearer swatches and looks here on the Bbia website. 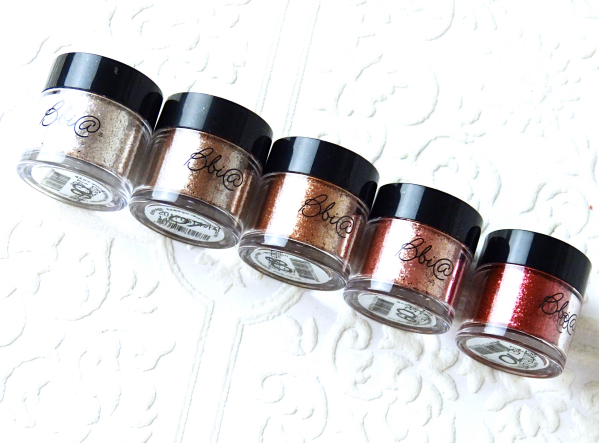 Are you a fan of loose eyeshadows and pigments? What is your favorite way of using pigments? Pigments have always been a little tricky for me to like, but when they're done right, they're amazing! 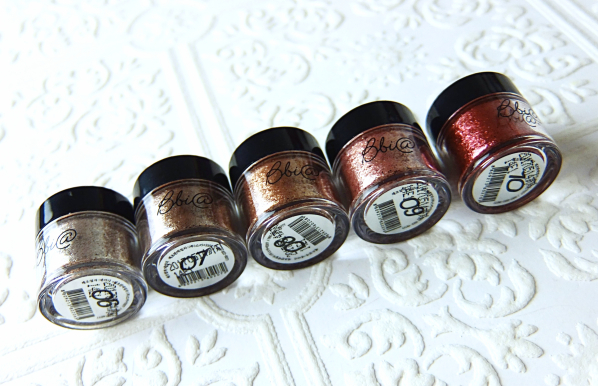 The swatched really well though and at less than $6 per pigment, what a deal! WOW, these are so PRETTY! OMG the Flavors series looks amazing!!! I would love to own all of them! Although I'd prefer to have them as pressed pigments these are just sooo brilliant in their finish! I would probably use them as a single shadow look! thanks for the review and swatches,Lena! I think these are really fun and look great, but I rarely get that adventurous with eye looks and would only need like one pot. :) They kind of sound like a loose (and more pigmented) version of the Armani ETKs or L'Oreal Infallibles. I guess these pigments are slightly drier than the ones you mentioned, but I think you're about right. Very pigmented and long lasting, too. i LOVE the look of these, especially when i see youtubers use them in their tutorials, but i know that i do not have the skills to apply these! #8 is really pretty. Awww this pigments are very very beautiful and super pigmented! Wow. These are so pretty. And HIGHLY pigmented! I am not usually bold with my eye makeup, but I kind of need that "mild" color!